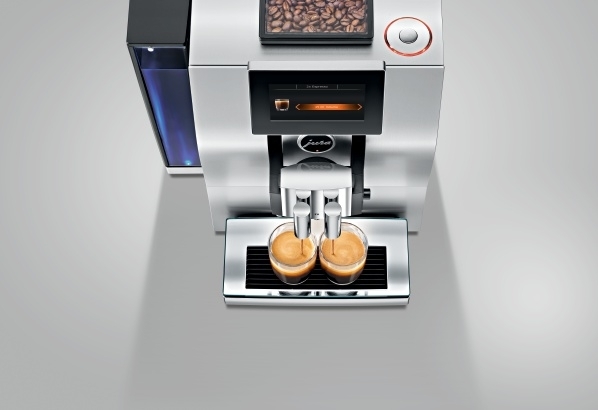 The Z8 from JURA boasts an unbeatable standard of coffee. 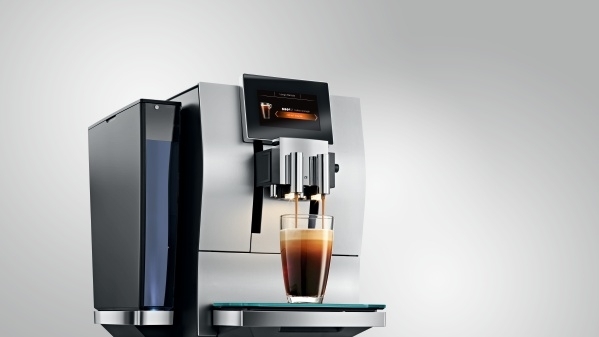 For long coffees, the world’s first automatic coffee machine for the home with one-touch Americano function that uses a special preparation method to properly combine the coffee with hot water during the extraction process, resulting in full-bodied, deliciously light Americano coffee. The Jura Z8 is also Bluetooth compatible providing advanced control through the Jura App, J.O.E. 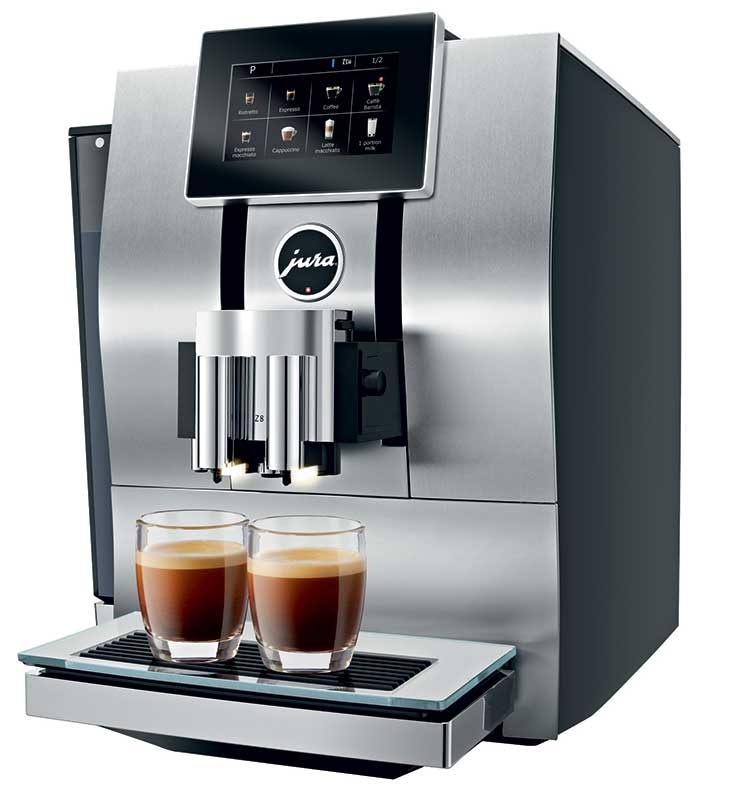 The Jura Z8 coffee machine revolutionizes the brewing process. From ristretto to flat white, this high-tech counter top espresso machine sets the standard for specialty coffee brewing. 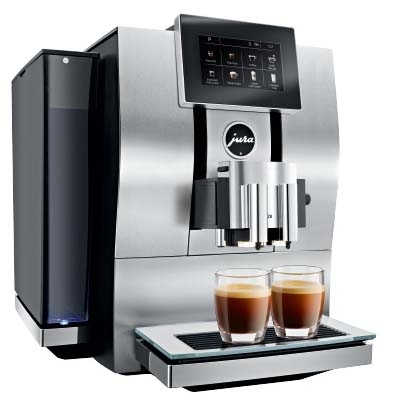 Impressive Swiss innovation perfects the brewing process, allowing the Jura Z8 to achieve the same standards as the best coffee bars in the world. The new Pulse Extraction Process (PEP) that optimizes extraction time by pressing water through the ground coffee in short bursts. The selection of 21 different specialties takes place intuitively, thanks to self-explanatory graphics on a high-resolution 4.3" touchscreen color display. Bluetooth compatible providing advanced control through the Jura App, J.O.E. 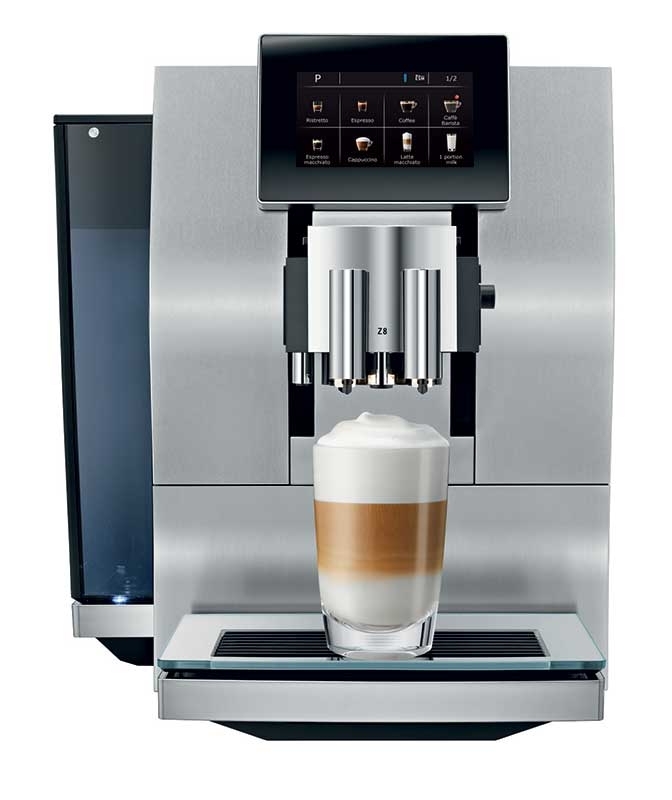 Inspired by know-how from the world’s best baristas, the Z8 turns enjoying a coffee into a long-lasting pleasure. For the Caffè Barista, the Americano and the jug of coffee, it uses a special preparation method to also combine the coffee with hot water during the extraction process to produce full-bodied, delicate, deliciously long specialties. With a precise, 4.3", high-resolution touchscreen color display, JURA is laying down a marker for coffee machine user interfaces. Just as impressive as its imposing screen is the completely new operating concept. It sets itself apart thanks to its clear layout and simplicity in keeping with the times. The touchscreen literally puts all your favorite coffees at your fingertips. 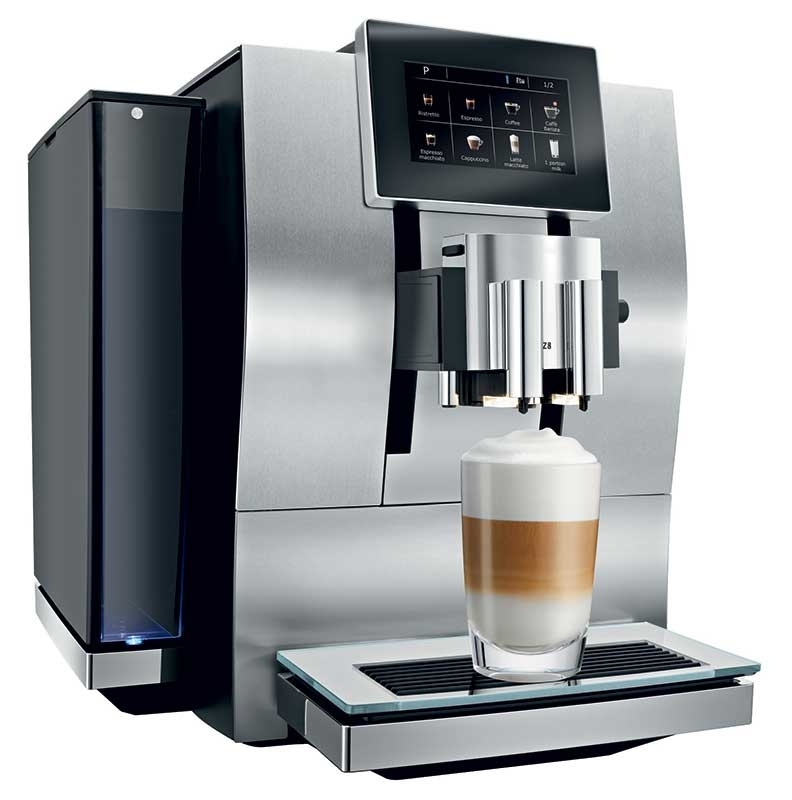 State-of-the-art Swiss technologies ensure top barista-style quality. The AromaG3 grinder is now twice as fast, yet preserves all the delicious aroma of the coffee be-ans. The Pulse Extraction Process (P.E.P.®) ensures the optimum extraction time by pulsing the hot water through the ground coffee at the exact frequency for the amount of water to create a short specialty, such as a ristretto or espresso. Even on-trend creations with milk and milk foam are exceptionally easy to produce by simply touching the display. The Z8 makes a statement for variety and choice. 16 different specialties can be selected simply by touching the start screen, and a total of 21 beverages are available via the Rotary Selection. What’s more, there’s still plenty of scope for coming up with personalized creations and names – let coffee fire the imagination. Thanks to an exclusive two-compartment cleaning container included with the Jura Z8, cleaning the milk system easier than ever. Three temperature levels of hot water; for black tea, green tea or cup warming. Pulse Extraction Process (P.E.P.) is a revolutionary technology that optimizes the extraction time, allowing even short specialty coffees like ristretto and espresso to be prepared with an intensity and breadth of aromas like never before. The water is pressed through the ground coffee in short bursts, optimizing the extraction time. Variable brewing chamber accommodates 5 to 16 grams of ground coffee allowing up to 16 ounces of brewed coffee. Intelligent Pre-Brew Aroma System (I.P.B.A.S.©) is a pre-brew process that develops the maximum flavor from any blend or roast of coffee. A small amount of water is heated and dispensed over the ground coffee causing the coffee to swell, preparing it for optimal flavor extraction. Clearyl Smart water filtration, removes chlorine, calcium and other impurities for better tasting coffee and extended machine life. Automatic filter detection thanks to modern RFID Technology. Using a filter has never been easier, more effective or more reliable. The architecture of the new six-level AromaG3 grinder has been impressively optimised and it works quickly but gently to preserve the full aroma when freshly grinding the beans to the ideal fineness. The grinding time and noise have also been greatly reduced. The coffee beans are freshly ground each time to guarantee maximum flavor. You can adjust the grinder setting to select the fineness of the coffee powder you want. This affects the flow-through time of the water, the so-called extraction time. The finer the powder, the more intensive the flavor. The cutting angles in the grinding cones of the AromaG3 grinder have been perfected. The JURA engineers have thereby managed to increase efficiency significantly. As a result, the perfect aroma can now be achieved in all its natural fullness in half the grinding time. Active bean monitoring warns you when you are low on beans. Two pumps and two heating systems allow the coffee and milk to be prepared at the same time. Fine Foam Technology - Coffee specialties such as cappuccino, latte macchiato and so on are prepared with milk or milk foam. JURA's innovative milk foam frothers use revolutionary fine foam technology to create a finely textured milk foam with a long-lasting consistency or to simply heat the milk to the desired temperature. The foam is both fine and compact, giving it a creamy consistency with a subtle sweetness. The frothers have two separate chambers in which the milk is frothed twice. Any bubbles that form will burst, compacting the foam and making it extremely fine. Three bars in the frother spout slow down the foam as it exits the frother, so it is poured slowly and evenly into the cup. Color 4.3" Touchscreen TFT display with Rotary Selection for self-explanatory, intuitive operation. It’s an operating concept that sets new standards. Simply turn the Rotary Switch and a list of specialty coffees appears on the modern TFT display. All you need to do is press the button once, and you’ll soon be drinking coffee that fulfils your wildest dreams. The foam is both fine and compact, giving it a creamy consistency with a subtle sweetness. The frothers have two separate chambers in which the milk is frothed twice. Any bubbles that form will burst, compacting the foam and making it extremely fine. Three bars in the frother spout slow down the foam as it exits the frother, so it is poured slowly and evenly into the cup. Integrated rinsing, cleaning and descaling programs. Dual coffee spouts are height and width adjustable: Height 3.2" to 6", Width .8" to 2.0"
Height adjustable milk spout 3.2" to 6"
Height adjustable hot water spout 3.2" to 6"
White cup illumination during preparation of milk based drinks. Sound Design - Thanks to close, effective cooperation with acoustic engineers, the grinding sound typical of fully automatic machines is effectively suppressed to the level of background noise. As a result, the Z8 is unbelievably quiet. 9.9 oz. bean hopper with tight-sealing aroma preservation cover.